42 | TH E M R EP O RT SERVICING THE LATEST O R I G I NAT I O N S E R V I C I N G DATA G O V E R N M E N T S E C O N DA R Y M A R K E T Simplifying Mortgage Assistance A new mortgage application allows servicers to help borrowers resolve delinquencies quickly. 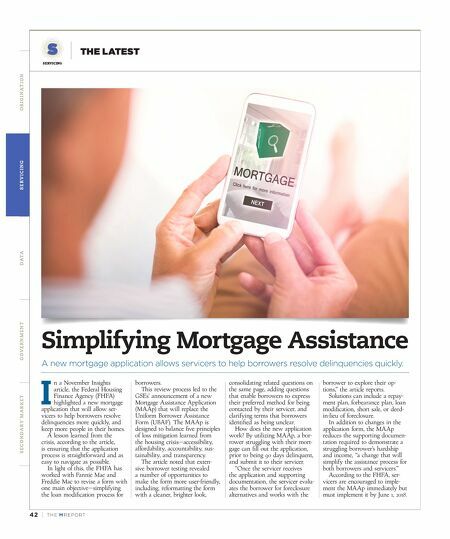 I n a November Insights article, the Federal Housing Finance Agency (FHFA) highlighted a new mortgage application that will allow ser - vicers to help borrowers resolve delinquencies more quickly, and keep more people in their homes. A lesson learned from the crisis, according to the article, is ensuring that the application process is straightforward and as easy to navigate as possible. In light of this, the FHFA has worked with Fannie Mae and Freddie Mac to revise a form with one main objective—simplifying the loan modification process for borrowers. This review process led to the GSEs' announcement of a new Mortgage Assistance Application (MAAp) that will replace the Uniform Borrower Assistance Form (UBAF). The MAAp is designed to balance five principles of loss mitigation learned from the housing crisis—accessibility, affordability, accountability, sus - tainability, and transparency. The article noted that exten- sive borrower testing revealed a number of opportunities to make the form more user-friendly, including; reformatting the form with a cleaner, brighter look, consolidating related questions on the same page, adding questions that enable borrowers to express their preferred method for being contacted by their servicer, and clarifying terms that borrowers identified as being unclear. How does the new application work? By utilizing MAAp, a bor - rower struggling with their mort- gage can fill out the application, prior to being 90 days delinquent, and submit it to their servicer. 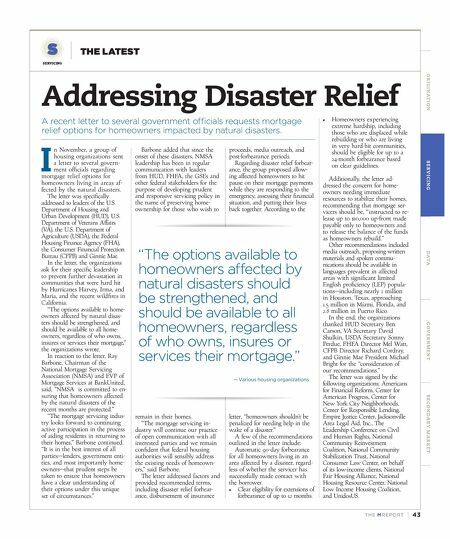 "Once the servicer receives the application and supporting documentation, the servicer evalu - ates the borrower for foreclosure alternatives and works with the borrower to explore their op- tions," the article reports. Solutions can include a repay- ment plan, forbearance plan, loan modification, short sale, or deed- in-lieu of foreclosure. In addition to changes in the application form, the MAAp reduces the supporting documen - tation required to demonstrate a struggling borrower's hardship and income, "a change that will simplify the assistance process for both borrowers and servicers." According to the FHFA, ser - vicers are encouraged to imple- ment the MAAp immediately but must implement it by June 1, 2018.